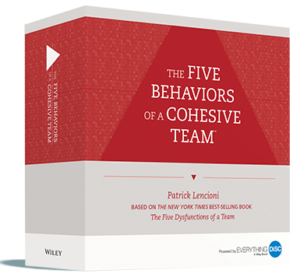 The Five Behaviors of a Cohesive Team facilitation kit comes with everything you need to begin a transformative experience with your teams today! The box includes a USB drive with a PowerPoint presentation and over 40 hours of video content. You will also receive one set of takeaway cards to hand out at your training. The kit also includes a Facilitator’s Guide, which includes scripted sessions and experiential activities; presentation materials; handouts; and sample reports to help facilitators prepare for team sessions. Also included are audio podcasts that provide insights on each of the five behaviors, the team profile, and the Annotated Team Report. Facilitators who intend to take multiple teams through this process will want to consider opening an EPIC account. An EPIC account will allow you to send out your reports, monitor your team’s progress, generate free comparison and progress reports throughout the process, brand your report covers, and gain access to your reports at any time. Purchase individual reports or additional Five Behaviors materials.